As unique as the individual who carries them! Each of these AA Anniversary stones is carefully hand selected from natural river stones. We then lovingly laser etch our familiar AA Anniversary/Birthday Medallion design with the year designation (Roman Numeral) of your choice. Any year designation can be accommodated! As our Serenity Stones are laser etched (not carved), they have a unique and appealing look! Some have said that the design almost looks like it was put on with sidewalk chalk! ...only the design doesnt rub off or disappear when it rains! Our laser etching process leaves each stone feeling as smooth and as naturally polished looking as the day it came off the river bank! Our process does not chip or damage the stones in any way or make them prone to cracking as some carving techniques are known to do. We take great pride in our methods and know that you will enjoy these beautiful stones for many, many years! Be sure to enter the year designation in the option box above - enter the quantity desired of that specific year - finally click "Add to Cart." This process needs to be repeated for each unique year stone desired. I have had a couple of these recovery stones. They are great quality and the etching is clear and easy to read. I also have a pocket gem that was personalized with my name and sobriety date. I wish they had that option for the Recovery Stones as well because I am more happy with the etching on the stones than what is available on the gems. You will not regret this purchase. This was a great gift for my sponsor! He had, in his 37 years in AA, never seen such a chip. Q: Can we get sobriety date or group name on these? A: Thanks so much for your question! Indeed, nearly ANY design can be engraved on these natural river stones. 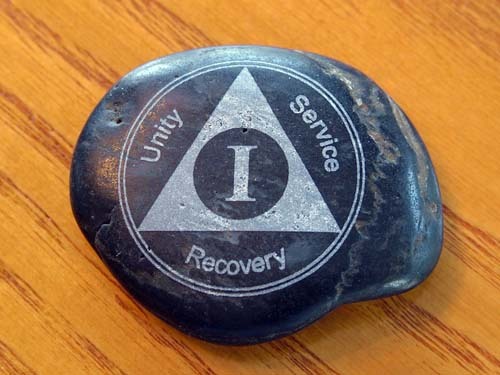 If you can reach out to us through the "Contact Us" form and provide us with the details of what you would like to see on your Sobriety Stone(s), we will be happy to provide you with a quote. Thanks again for your question!